Luscious green islands, white sand beaches to squish your toes in and clear blue water…we’ve all seen the magical Thailand islands on a postcard, magazine or scrolled through social media feeds. Like any other like-minded soul with a passion to travel, I knew I had to experience this place for myself. To my surprise, those pictures captured only a handful of the countless islands that surround Thailand. With over a hundred islands, how on earth do you choose where to go??? If you're anything like me, you create this idea that you can go to multiple islands around Thailand; with ferries connecting them together, how hard could it be to get to each one? This could be true if you had several weeks to travel around the islands, but for a one week trip I found this idea was a little ambitious. There are plenty of times in life that we build up these expectation in our heads about how things are going to look. I’ve learned (the hard way) to accept situations as they come and not be attached to the outcomes of expectations. Allowing for spontaneity can bring on some of the most memorable experiences. I began my adventure by flying from Bangkok to Phuket, one of the larger Thai islands known for partying, spring break, and beaches. My plan was to spend a couple nights there and then try to venture off to some of the more secluded islands after that. After talking to some tour agencies, I found most islands are anywhere from 1- 5 hours travel by boat from Phuket. 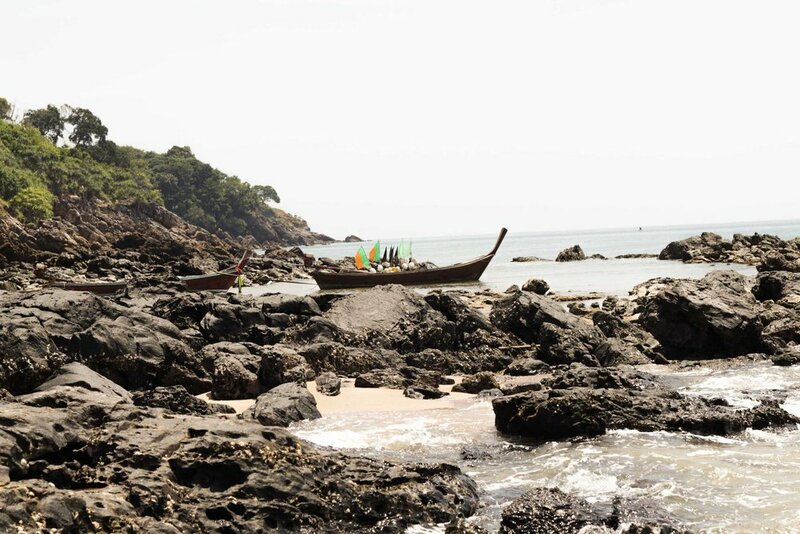 I knew very little about the different islands but had heard that Ko Lanta is very beautiful and worth my while, so that was on the top of my list. One thing led to another and I arranged a ferry ticket that left Phuket and transferred at Phi Phi Island to Ko Lanta. This was supposed to be so easy...but reality tested my flexible, easy-going nature! The only (and most important) thing that the lady failed to mention to me was that the ferry transfers do not run every day. During high season they run on a different schedule than low season. Unfortunately for me, I was traveling during low season, and the ferries only ran twice a week. Life lesson #2, do your research! If I would have done a little more research by asking around and reading on the internet, I probably would have been advised to take a day between the transfers, and seen the different schedules for high and low season. Like many things in life, we can’t always jump into them blindsided, some research helps avoid the frustrations. Arriving to Phi Phi Island, I soon realized that my transfer ticket was not going to work until the next day. I previously booked my hotel on Ko Lanta so persistent me knew I needed to find a way there today. After speaking to a couple people nearby, I reluctantly jumped on the only other ferry headed to Krabi, an island just North of Ko Lanta. It was at least one step closer, or at least I thought. I arrived to Krabi at 5 pm, anxious for this adventure to have a happy ending, but I had to figure out how to get to my final destination that was still 3 hours away. I finally found a reluctant taxi driver to transport me to the beautiful paradise that lured me into this crazy adventure in the first place. That night I truly appreciated the beautiful resort and my comfy bed! All in all, here is few words of wisdom from a 20-something adventurous girl; Take your time getting from island to island. Experience your destination and don’t rush it by staying only one night at each stop. Most importantly, make sure to double check with the direct ferry agencies that the ferries are running as scheduled. Regardless of my long, confusing, and frustrating days of travel, I always find a lesson to be learned from each situation. When you allow yourself to appreciate the experience you learn life lessons, which help us grow, and widen our perspective of the world. No matter how hard or stressful a situation is there is always something that you can take from it. What your mom told you as a kid growing up is indeed true. Patience goes a long way in all situations. I could have easily gotten very stressed, mad, and furious about the whole ferry schedule. Instead I took a deep breath, explored options at each obstacle, and how to make the best out of it. Don’t forget that you are a visitor in a foreign country and we are ambassadors of our home country. How we behave is a direct reflection of how people will view others from your country in the future. Sonja is an enthusiastic adventurer traveling the world. When she’s not working on her computer as a developer she is behind the lens capturing everyday moments.